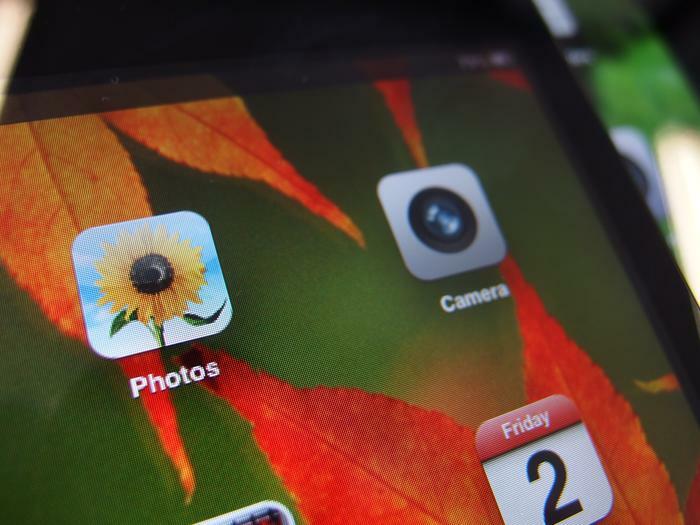 We go hands-on with Apple's iPad mini. Apple's new iPad mini officially went on sale across Australia this morning and we've got one in our hands. Here's our brief first impressions. The weight. 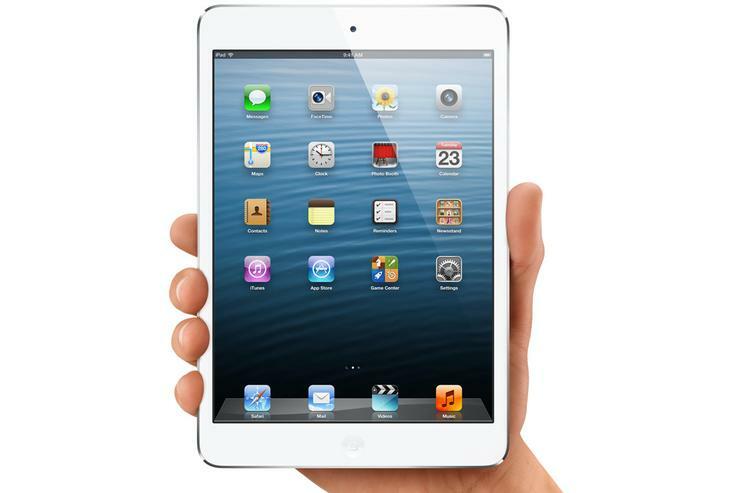 You'll be astounded at how light the iPad mini feels when you pick it up for the first time. At 308g, (Wi-Fi only model) it feels much lighter than you expect it to for a product of this size. Putting it into perspective with the competition, the iPad mini has a larger screen than Google's Nexus 7 and is constructed from aluminium rather than plastic, yet it weighs 32g less. Apple products are well known for this sort of engineering, but it's no less impressive when you pick one up for the first time. 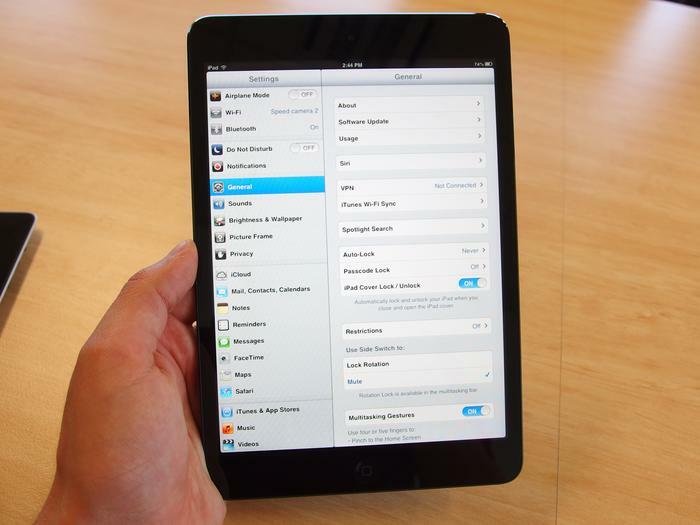 You'll be astounded at how light the iPad mini feels when you pick it up for the first time. The construction. As you'd expect from an Apple product, the iPad mini really feels like a premium device. The bevelled, laser cut edges, the smooth, rounded corners and the well positioned volume buttons are just some of the touches you'll immediately notice. Although many (including myself) will argue that the iPad mini is priced at a premium, Apple's attention to detail when it comes to design certainly doesn't go unnoticed. 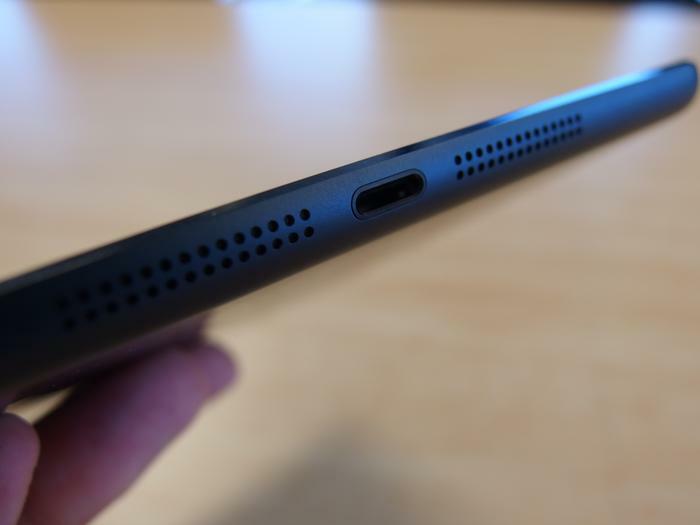 The iPad mini uses Apple's new Lightning connector port. General performance. While the iPad mini's older components (an A5 processor and only 512MB of RAM) can't match the internals of the new 4th Generation iPad, they don't affect the iPad mini's general performance. The mini isn't as snappy as its bigger brother when it comes to opening apps and takes longer to load graphically intense games (like Gameloft's Modern Combat 3, for example) but day to day tasks aren't affected. The iPad mini's screen orientation still rotates faster than any Android tablet we've tested and there's no evident lag or delay when swiping through your apps on the home screen. The user experience remains as smooth as any other iOS device. That non-retina display. If you regularly use a third or fourth generation iPad, or any other Apple product with a retina screen, you'll immediately notice the display. For all the wrong reasons. It's certainly not a bad display by any stretch of the imagination, it's just nowhere near as good as screens with higher resolutions. The iPad mini can't display the same super sharp, crisp text as higher resolution screens. Colours are bright and vibrant and viewing angles are impressive but the iPad mini just can't display the same super sharp, crisp text as higher resolution screens. The lower resolution is particularly noticeable when viewing text-heavy websites on Safari without zooming in. The mute slider. It feels a little loose and doesn't exhibit the same premium quality as the rest of the iPad mini's buttons and ports. The same issue exists on the third generation iPad, too, but we found it more profound on the iPad mini. The iPad mini on top of the larger, full-sized iPad, in this case a 3rd Generation model. The price. There's no way around it, the iPad mini is expensive. 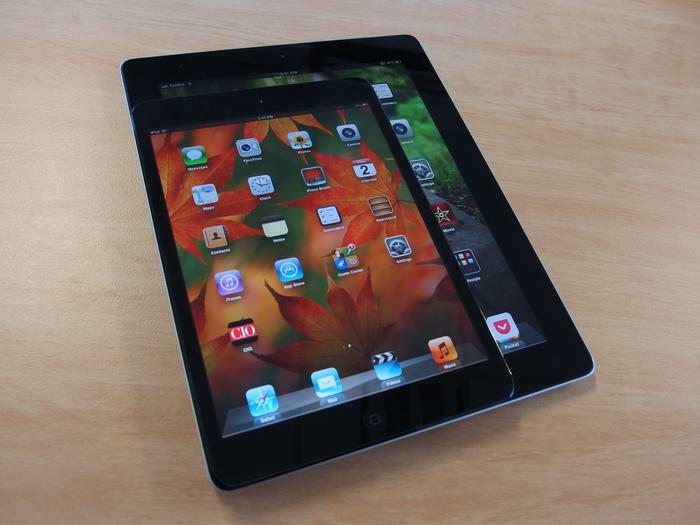 Apple will argue that it is not a seven inch tablet and therefore not competing with devices like the Google Nexus 7. While that might be true, the fact remains that the Nexus 7 represents excellent value for money and is certainly comparable, even if it does have a smaller screen. We'll have a full review of the Apple iPad mini published sometime in the next week. In the meantime, if you have any questions about the iPad mini, let us know in the comments below!